For some individuals, dedicated hearing aids can be uncomfortable, so it's vital that an effective alternative can be provided. The Geemarc Conversation and Listening Aid is a personal hearing enhancement amplifier for hard of hearing people who do not wear hearing aids. Its amplification feature combined with tone control is ideal for one-to-one conversation. With up to 25dB of amplification, the listening aid is ideal for hard of hearing individuals who do not have a hearing aid. The super-sensitive microphone helps you pick up more details and is ideal for use during conversations. What's more, the listening aid also features +/- 5dB of tone control. This enables you to adjust the tone of the sound to better match your hearing needs to make conversations even clearer. 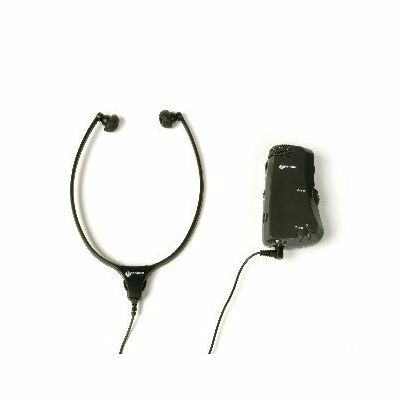 To help you make the most from the Geemarc Listening Aid, it features a headset with a fantastically light and comfortable design, making it ideal for regular use. The device also features a special coating that works to eliminate the noise produced by handling. This helps reduce interfering sound to aid clarity further. I bought the Conversation Aid for my aunt who is 98 years old. She would not wear a hearing aid but is quite happy to use the aid when we visit. It has made things so much easier, before we had to sit so close and shout to make her hear. Now we can have normal conversations. I cannot recommend your service highly enough. Easy to use website and the product arrived in record time. Also by filling in a simple form you sent me the VAT back.